Does it happen to you to wake up after 8 hours of sleep and still feel exhausted? Is your sleep turbulent and your mind is full of concerns? Do you have the constant feeling that you lack energy? 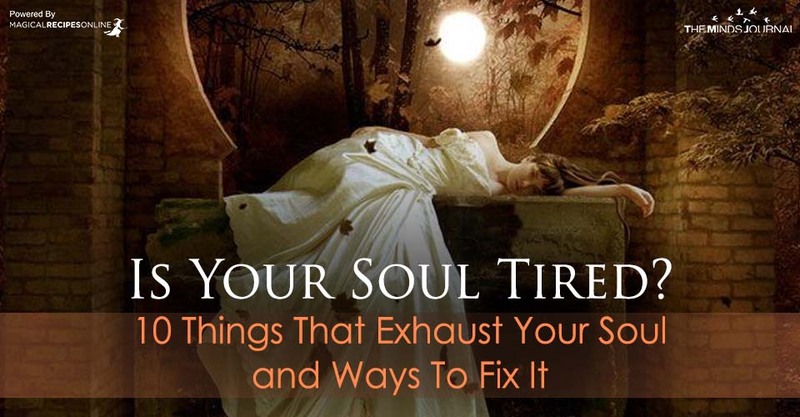 If you experience all these, it is highly probable that your soul is tired. Having a tired soul leads to a life that is not aligned with your personal goals and the orientation you wanted to follow. Not only are you caught by fatigue. You also have the feeling that your way of life is pointless, your efforts in vain and you are moving towards the wrong direction. Consequently, your energy is wasted against fighting this condition. Its flow becomes gradually weaker. It is like a flame flickering in an empty room. In order for you to check the levels of your energy, rub the palms of your hands for 30 seconds. Then remove them away from each other slowly. If your energy levels are high and your soul in balance, you will have to detect a vibration and warmth between your palms. On the contrary, if you trace no energy, this is an indication that something is going wrong. You have run out of energy and your soul is tired. You participate in trivial quarrels or tattle. Toxic people, partners or friends are all around you. Negative thoughts constantly take grip on you. All the above can make a soul tired. In turn, this may cause more severe problems, such as depression and loss of mental capacities such as intuition and empathy. It could also lead a person to addictions or grave psychological problems. Therefore, if your soul is tired, it is urgent that you undertake some changes. The first step is to trace the root of this situation. When you are sure about the causes, you should be ready to confront yourself with them. Practice daily Meditation. Check for example our Meditation technique. Read books about spiritual life. This will inspire you to search for your true nature. Listen to good, spiritual Music. Protect and Attract Positive Energy through Magic! Set a concrete, positive and inspiring goal and work towards it. Try to avoid toxic people. Do some outdoor sport, such as jogging or swimming. Through that, try to connect with the nature. Love yourself. Even if you believe you are not perfect, you are already someone special and you deserve something better. And besides, ourselves is the only thing we really possess, and we can only work on our own self-improvement. Of course, if the symptoms of a tired soul are really intense, consult a medical doctor or a psychologist. However, try to get out from this state of mind and heal your soul. Once you decide to get started, the positive results can appear really fast.